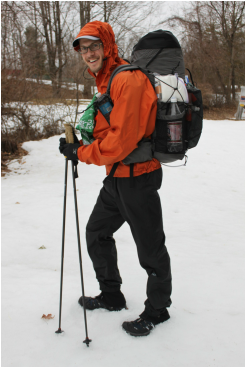 I've hiked about 500 miles with the MLD Exodus (3,500 cubic inch (cu in)) frameless pack. This is an extremely durable pack from a great manufacturer. This pack is fairly large and would be good for higher volume gear like winter camping or 3 season gear that doesn't compress as well as others. My gear weight was around 12 lbs or less when I used this pack, and since I used the Exodus on the Appalachian Trail (AT) I never had to carry more than 5 days of food and a couple liters of water. Here are my thoughts on this pack. Though completely worth it, $195 is expensive for a frameless pack, and may not be the best option for someone new to lightweight backpacking. Made in the USA at the shop in Roanoke, VA increases the cost slightly over other bags. Frameless bags require a specific packing method, and with a weight limit of 25 lbs, many new backpackers will want a light internal frame to help transfer more weight off of their shoulders. SUMMARY: Top marks across the board. If you are looking at this pack, then you probably have your gear weight dialed in fairly well and know the limitations of frameless packs. Most frameless packs are comfortable to about 25 lbs., and this one is no exception. This pack is great for lightweight 3 season or even winter use. With it's sturdy and long-lasting design it will provide years and years of solid use in all traveling conditions.